WASHINGTON, May 26 2015 (IPS) - Internationally supported sanctions against Iran could begin to crumble if talks over Iran’s nuclear programme fail to produce a final deal, according to Germany’s envoy to the United States. “The alternatives to the diplomatic approach are not very attractive,” said Ambassador Peter Wittig Tuesday. “The alternatives to the diplomatic approach are not very attractive." -- German Ambassador Peter Wittig. “If diplomacy fails, the sanctions regime might unravel…and we would probably see Iran enriching once again as it has done before the negotiations started,” said the diplomat during a panel discussion in Washington at the Atlantic Council. The sanctions that have ravaged the Iranian economy face far less risk, however, if Tehran were seen as responsible for the failure, according to the United Kingdom’s envoy to the U.S.
“If there is not a deal because the Iranians simply will not live up to [their obligations] or [fail to] implement…then I think we carry on with the sanctions regime and in certain areas it may be right to try to raise the level of those sanctions,” said Ambassador Peter Westmacott. But Westmacott agreed with his German counterpart that if Iran were not to blame, the sanctions regime could fall apart. “At the same time, if we were to walk away or if the [U.S.] Congress was to make it impossible for the agreement to be implemented…then I think the international community would be pretty reluctant, frankly, to contemplate a ratcheting up further of the sanctions against Iran,” he said. “A number of countries” already “don’t respect” sanctions and are buying Iranian oil, he added. 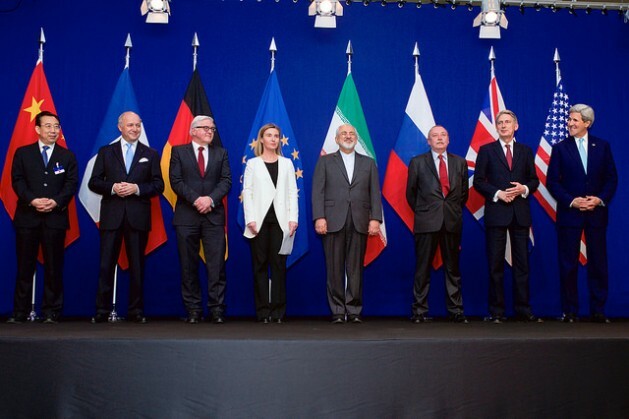 Ahead of the June 30 deadline for reaching a final deal, Iran will resume the negotiations with representatives from the P5+1 or E3+3 (the five permanent members of the U.N. Security Council plus Germany) Wednesday in the Austrian capital of Vienna. Talks with Iran over its controversial nuclear program have been ongoing since 2003, when France, Germany and the United Kingdom (the E3) began to engage Iran in an attempt to limit its nuclear programme. Iran contends its programme has always been peaceful. The United States intelligence community has assessed that Iran was previously working towards mastering the nuclear fuel cycle, but has not restarted a nuclear weapons program. “It’s a political decision for them. Not that they don’t have the technical wherewithal, the technical competence, because they do,” said the U.S. Director of National Intelligence James Clapper March 2 on PBS’ “Charlie Rose” show. Although Iran and its negotiating partners have made several historic diplomatic strides since an interim nuclear agreement was reached 2013 in Geneva—notably the ongoing high-level direct contact between previously hostile Tehran and Washington—the talks have yet to produce a final deal. It’s unclear how much progress has actually been made in the complex private negotiations since a preliminary framework agreement was declared on April 2, but the parties are currently in the drafting phase. The French ambassador to the United States, Gerard Araud, wasn’t optimistic here Tuesday. “It’s very likely that we won’t have an agreement before the end of June or even (right) after,” he said. “Even if we get the best deal … afterwards, you will have to translate it into the technical annexes, so it may be … we could have a sort of fuzzy end to the negotiation,” he added. While domestic politics in the key capitals of Tehran and Washington could ultimately prove to be the greatest barriers to a final deal, all sides seem to be waiting until after the deadline to make more moves. But patience is running thin among key Iranian and American lawmakers, who have made no secret of their opposition to the talks. If no deal is reached by Jun. 30, the door to a wave of domestic criticism in both capitals will once again be wide open. Peter Jenkins, who previously served as the U.K.’s permanent representative to the International Atomic Energy Agency and the United Nations, told IPS that even if Iran were blamed for the breakdown of the talks, it wouldn’t end up totally isolated. “I doubt the non-Western world will be ready to believe that the blame for a break-down lies solely with Iran,” said Jenkins. “They will suspect that some of the blame should be ascribed to the U.S. and E.U. for making demands that go well beyond the requirements of the Nuclear Non-Proliferation Treaty. So those of them that have been applying sanctions may break away,” he said. “In the West, however, most countries will believe what the U.S. instructs them to believe and will continue to apply sanctions if required to do so by the U.S.,” he added. “Both sides have so much to gain from an agreement and so much to lose if they squander all that they have achieved to date,” he said.